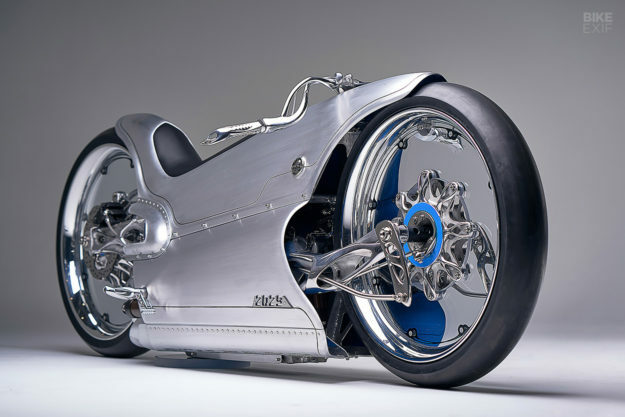 One of the most genre-smashing motorcycles of all time is the 1929 Majestic. 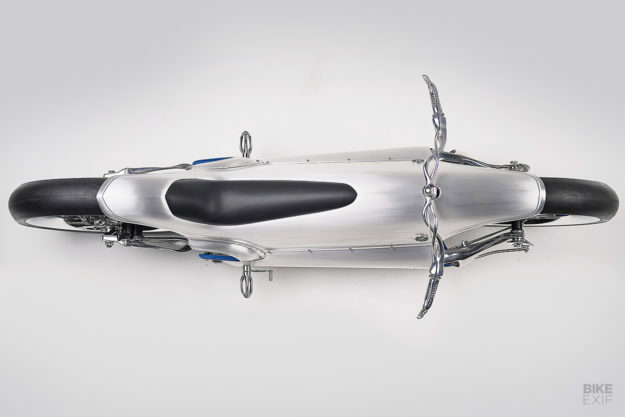 It looked like nothing else on earth—a streamlined Art Deco torpedo, with hub-centered steering and sliding pillar suspension. Ninety years later, the French masterpiece is still casting its spell over custom builders. Bryan Fuller has just fallen under the influence, and created an extraordinary homage called 2029. The build is Fuller’s response to the unprecedented levels of change the moto industry is experiencing right now. 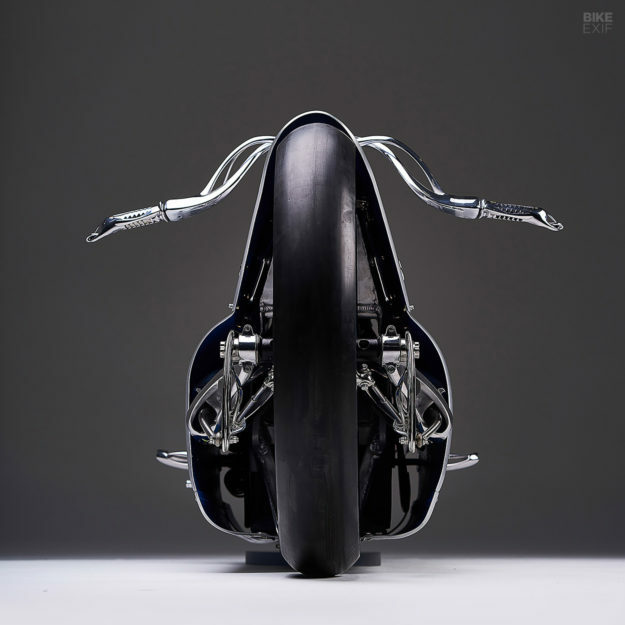 “At its core, the art of motorcycle building is still very similar to its origins,” he notes. Quite simply, 2029 is a bold move to prepare us for a future where anything is possible for a new age of customs. 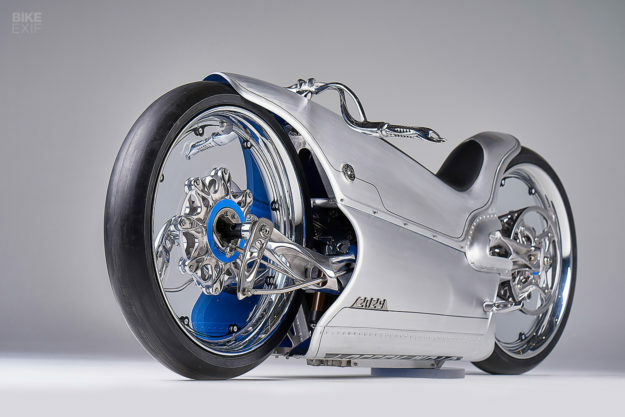 It’s an electric bike with a fully enclosed sculptured aluminum body, hub-centric steering, clear polycarbonate wheels and titanium parts printed on a 3D printer. 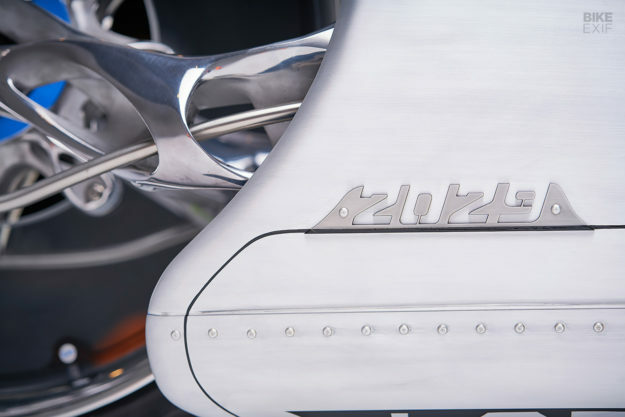 With 2029, Fuller wanted to capture next-level design elements and intricacies that, until today, were difficult to hand craft. Instead of traditional fabrication, he’s used 3D metal printing. 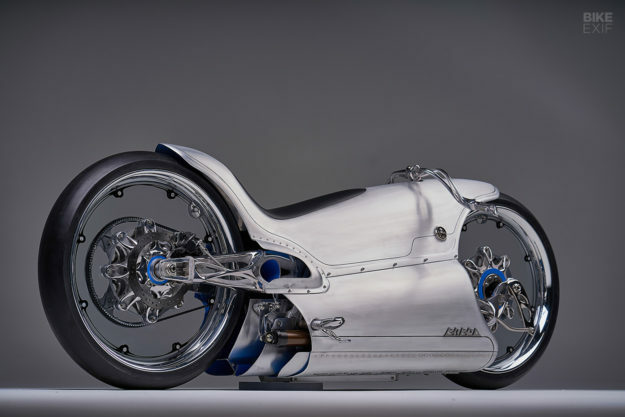 Bryan Heidt, lead metal fabricator at Fuller Moto, worked with Fuller on the design concepts and provided the initial CAD model dimensions, to ensure optimum form and function. The Fuller team then shared the models with futurist designer Nick Pugh—a renowned movie concept artist who has worked on Star Wars. The 3D printing specialist Oerlikon then took the CAD designs from Pugh, and turned the parts into metal using lightweight titanium. 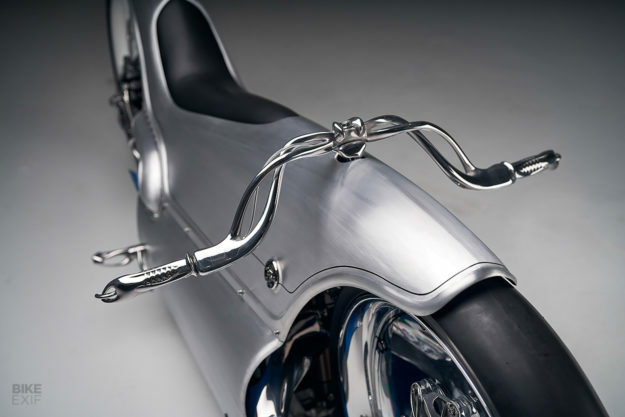 It also allows shapes that otherwise would be nearly impossible to handcraft: like the front stabilizer arm, positioned outside of the front swing-arm for an almost sword-shaped look. And the steering plate and heim [rose] joint mounted on the front hub. 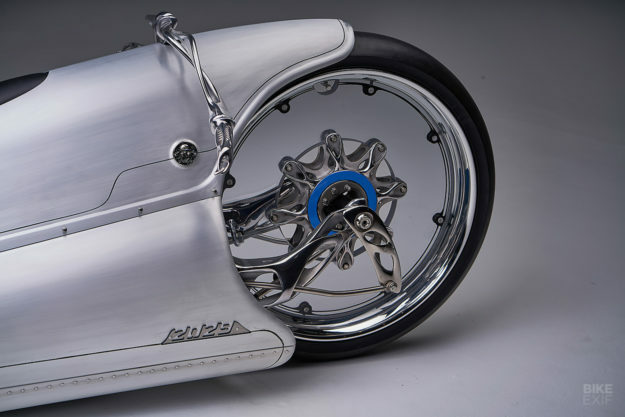 An electric powertrain was a natural fit, and Fuller has pillaged the drivetrain from a Zero FXS. The length of the Zero matches the dimensions of the original Majestic, but the motor sits too low and the batteries too high in the stock chassis. 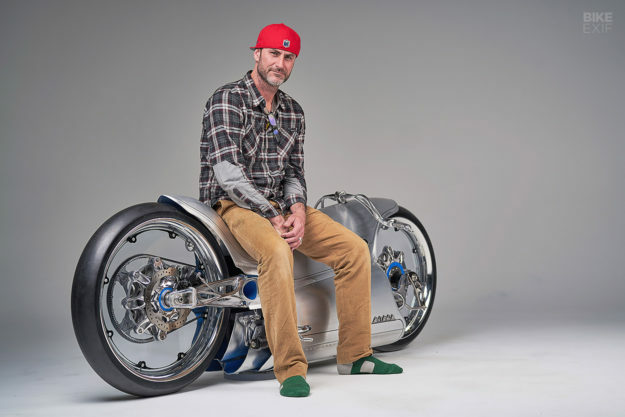 Undeterred, Fuller decided to flip the chassis upside down—and also modified the batteries so that the motor aligns with the tall, 23-inch wheels. Fuller himself patterned and shaped the ‘gills’ in front of the wheel. 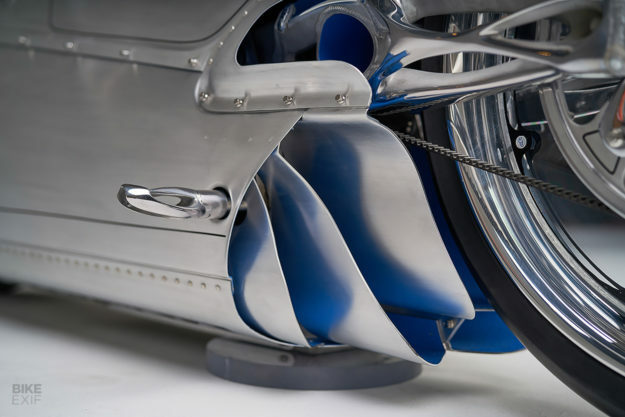 They act as diffusers for air flowing through the body panels, reducing drag. 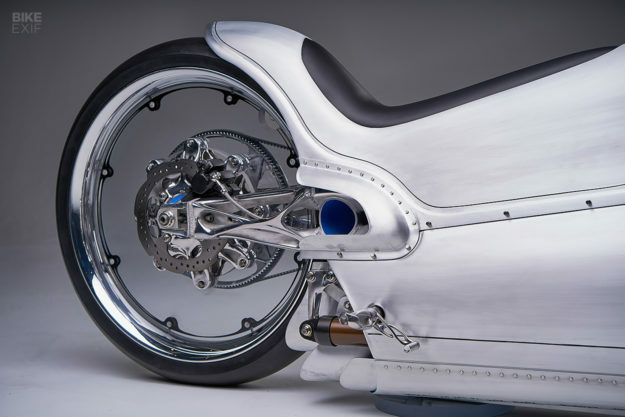 A tinted blue hue has been sprayed inside much of the body, including the gills, to add a subtle touch of color to an otherwise stark silver canvas. The blue was inspired by the original Majestic emblem, that was put on the 100 or so original examples. The hub-centric steering setup is worth an article in itself, since it has rarely been used—most notably by Bimota, Ner-a-Car and, of course, the 1929 Majestic. Bryan Heidt found and adapted a donor hub from a Bimota Tesi, which provided the right dimensions and fitted the overall design. With its unconventional style and innovative build techniques, 2029 provides us a glimpse of what may be to come. 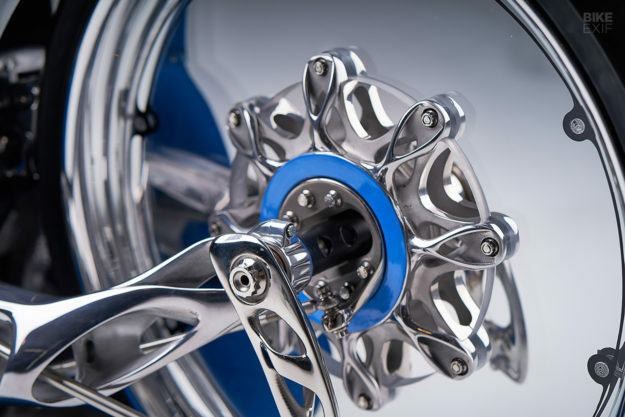 New processes like CAD and 3D printing are opening up a new world of possibilities. “This unleashing of creativity was the underlying intent of the 2029,” says Fuller.